Terra Forming Terra: The Legendary Hyperborea and the Ancient Greeks: Who Really Discovered America? This item helps us catch up on current DNA work which is nicely confirming my conjecture regarding the general extent of the Atlantean world. What is missing of course is the subsuded land masses that represented the actual core of this world. 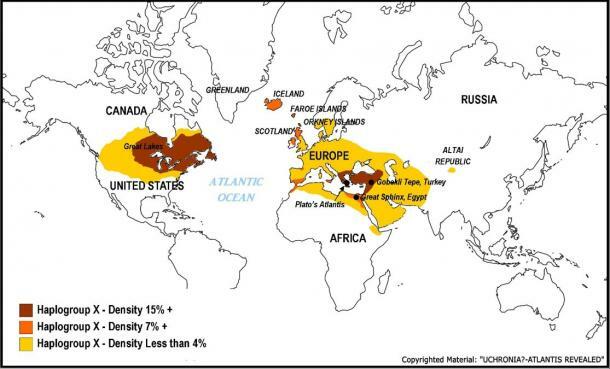 This distribution is only possible by plenty of direct colonization over the thousand year span of the high Bronze Age in which Atlantean shipping became truly global. We now understand that significant colonization took place in the Mississippi valley. The mound builders were a dominant class able to supply trade goods and knowledge to local communities. What is most surprising is just how persuasive the European penetration became. I for one did not start with that as a start point at all but came to it as brick after brick arrived and built an edifice of data. it was never anything other than Bronze Age but it was fed by normal trade and a natural currency that consisted of small copper ingots. The mound building and the pyramid aspect expanded globally and may have had a technological principle behind it all. We do not know for sure yet. What is surely clear is that seagoing allowed America to be discovered early. Serious trade began around 2500 BC. Add in major islands around the Azores and Lyonesse to make things easier and a France sized land mass on the Bahama Bank and navigation becomes completely creditable.